This event was enjoyable and successful. The customers were extremely generous in these difficult times. We really appreciate the support we receive from the public. A total of €11,265 was raised. The annual table quiz took place at The Showboat, Waterford. We had a most enjoyable and successful night and raised a total of €670. Michael and Geraldine participated on behalf of our Charity. 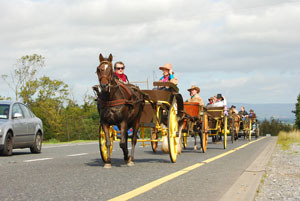 Wendy Rossiter and family from County Dublin, joined us on the walk. The day was scorching but we paced ourselves and thoroughly enjoyed ourselves. Between us we raised €1,400 on the event. Sincere thanks to all our generous sponsors. Mick and Maxine Creed participated in fundraising Charity event in Tully, County Clare and raised €200 for Marfan research. Sincere thanks to Mick and Maxine for their faithful support. The total amount raised in this bucket collection was €302. Sincere thanks to all. Sr Philomena Purcell participated on behalf of Marfan Syndrome Research for the fourth time. 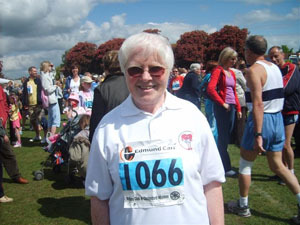 Philomena’s registered race number was the historic 1066 and finished the race in record time. Total amount raised was €1,074. Well done, Philomena! The total amount raised was €988. Thanks to the generosity of staff and customers.